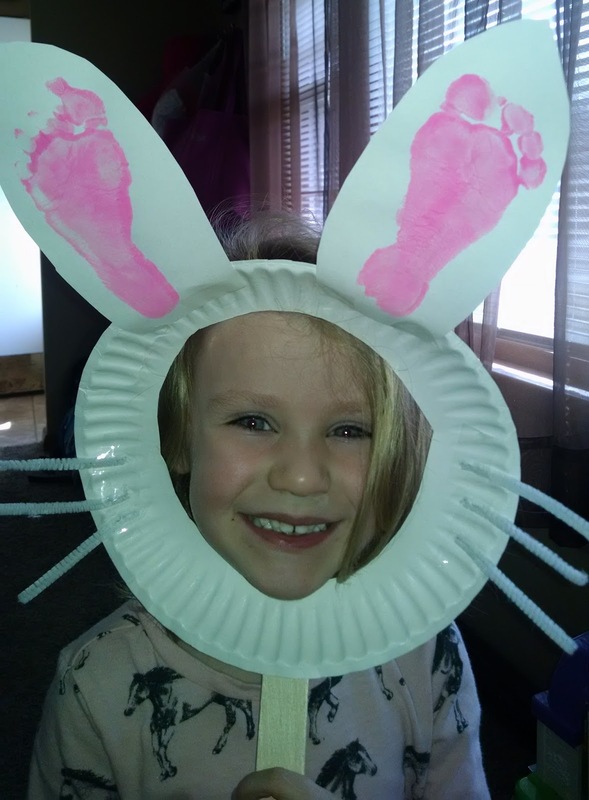 These turned out to be absolutely adorable so I had to share this cute craft just in time for Easter! Last year the kids were bunnies but that involved a lot of gluing, drying, and too many steps (I have younger kiddos this year). So we kept it very simple and all of the kids (even the babies) were able to participate in this year's Easter craft! I would have preferred to use glue to keep the Little Bunny Faces together, but recently gluing activities seemed to be incredibly messy. We broke out the Scotch tape instead and it worked out perfectly! Start by painting the child(ren)'s feet and put their prints on the construction paper. Cut them out in bunny ear shapes once paint has dried (ours dried quickly, within 45 minutes). Cut out the center of the white paper plate. Then start taping: tape on the white pipe cleaners on the side, the ears at the top, and the stick at the bottom. All kids age 1 and older easily helped with the taping (I did the cutting for them). Then they happily pretended to be bunnies and were so proud to show their parent's their craft at the end of the day! This would be a great craft to do at Easter parties or egg hunts (you could easily use a stamp pad instead of paint to make for an easier clean up). I love to do these crafts with the kids as a memento for each special occasion throughout the year!